Thermodynamics has played virtually no role in traditional emulsion research, because emulsions are inherently thermodynamically unstable. The problem with commercial emulsions needing to exist with none or only small changes during use and the industrial stability problem was resolved by formulating colloidally stable emulsions, i.e. the rate of destabilization was reduced. 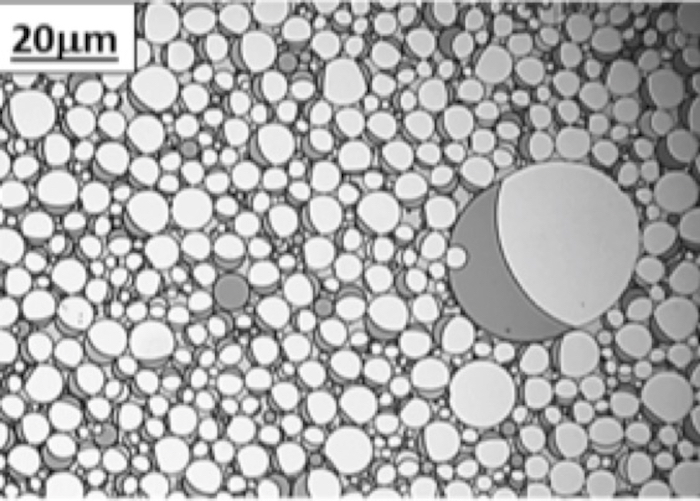 This approach was successful for single-oil emulsions, but encountered problems for double emulsions, for which the simultaneous stabilization of several interfaces within one drop encountered difficulties. Naturally, even for such an emulsion, colloid stability is the only option to stabilize the outer surface towards the continuous phase. In fact, the destabilization by flocculation/coalescence proceeds similarly to a single-oil emulsion. But experiments have demonstrated that complex emulsions with a thermodynamically stabilized inner interface retain the individual drop topology during the process. This result opens an avenue to significantly facilitate the formulation of a group of commercially important emulsions, because the cumbersome multiple emulsion stabilization is reduced to the more trivial single-oil emulsion case. Stig E. Friberg is currently Curators Professor Emeritus at Clarkson University. He got his PhD at the Research Institute for National Defense, working on the structure and colloidal properties of aluminum hydroxy-di-soaps. He served as Director of the Institute for Surface Chemistry - YKI in Stockholm (1968-1977) and later of various Chemistry Department in the United States such as Clarkson University. The main field of his research activity concerns the effect of surfactant self-association on the properties of macro-dispersed systems, with more than 700 publications and more than 40 PhD graduates. Friberg has received several scientific awards, such as honorary doctorates in Japan, Finland and Sweden, the Ostwald Medal (the highest award from the German Colloid Society), the National Awards from the American Chemical Society, and the Honorary Professorship from the Chinese Colloid Society.